Sorry, Aspire Elite Kit has been discontinued. 180 Smoke now offers Aspire's most advanced kit in its sub-ohm line of product, the Aspire Elite Kit, with the Aspire CF MAXX battery and new Atlantis Mega clearomizer. 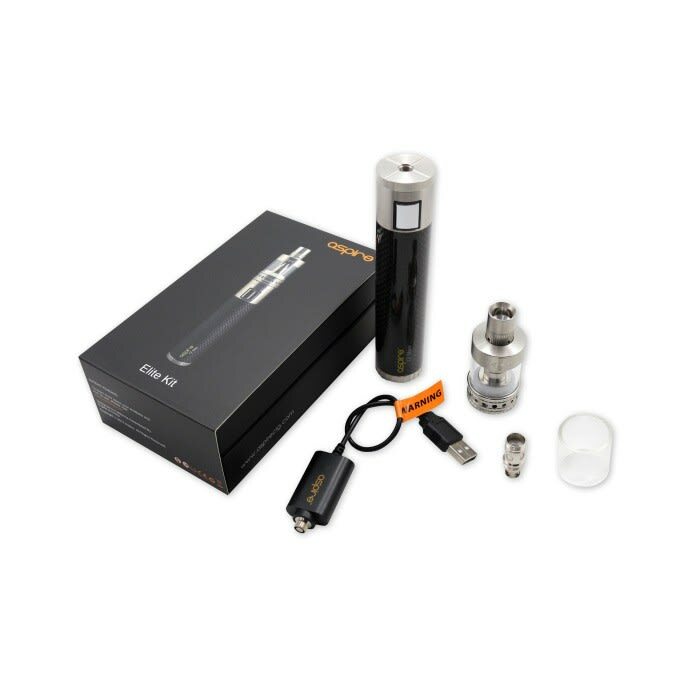 The newest kit from Aspire offers optimum performance, durability, tank and battery capacity. It features the new Aspire CF MAXX Battery and the upgraded Aspire Atlantis Mega clearomizer. The CF MAXX gives you plenty of capacity at 3000mAh, and the same great durability we've come to expect from the Aspire CF line of batteries. It is variable wattage from 5W to 50W, and is Sub-ohm compatible from 0.3 ohm to 5 ohms, and has a max voltage output of 4.2V. The Atlantis Mega features a 1.0 ohm Atlantis BVC coil with organic cotton out of the box, to be used between 40W and 50W, and also comes with the new 0.3ohm Atlantis BVC organic cotton coil that works best between 70W to 80W. It has a generous 5ml tank capacity and comes with a replacemebt pyrex glass tank. The adjustable airflow ring at the based has been improved upon the standard Atlantis, and it features the same revolutionary cooling system on the drip tip that was introduced with the Atlantis 2. Paired together the CF MAXX and Atlantis Mega offers one of the most powerful, long lasting, smooth and reliable vaping experience on the market. The kit also comes with a USB charger for the battery, a user manual, and a nice gift box, making it the perfect present for the vapers among your family and friends. Kit comes with everything you need to start vaping some of the biggest clouds you've ever seen. I produce more than all my friends, and the flavour, the flavour distinction with the amount of vape produced is delicious. 180 Smoke sold this to me and it arrived within the week! Love the vape output on this, I'm like the coolest in my bunch of friends!